Crown BF6000. putting the "killer" in killer power amps! I should add a word or two here about volume! Music volume is one the most common sources of complaints about DJs. It is also part of a never ending battle for which there is no perfect solution for either side. At any given instant, some will want the music LOUDER! Others will say it is already TOO loud. What's a DJ to do? Using the best sound system possible is a start. Distortion is a big cause of "it's too loud" complaints. When the distortion is coming from a sound system that is being asked to do more than it was designed for, the music can be both too loud, and not loud enough -- at the same time! When that happens, you lose! How many times have you heard a DJ system that absolutely stings up close, yet is nearly uninteligable from across the ballroom? It's a common problem with the all-too-popular DJ fad of putting their speakers up on sticks. To make this mini audio seminar complete, I should touch on one other phenomenon which often comes into play in loud environments (like dance parties). That is "aural fatigue" -- or what you could call disco deafness. Simply put, when the music is too loud for too long, your ears get "tired" (numb) and you can't hear as well. Consider the method DJ, who plays the music too loud anyway, and who stands between his speakers on stands all night long. Over the course of the evening he will suffer some hearing loss. (we hope it's only temporary). But usually, he will compensate by turning the volume UP. Can you see the vicious circle that usually ensues? These three pieces (1/3 octave EQ, RTA, and SPL meter) are considered indispensable by nearly all professional sound men. 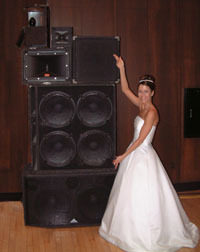 I have used them for years, because I consider high fidelity sound an essential part of my quality DJ presentation.